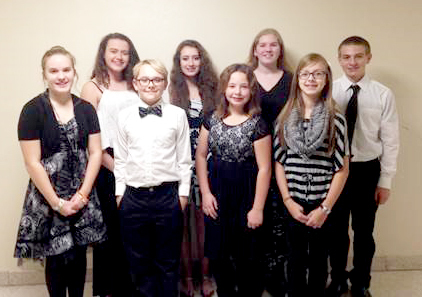 The Phoenix Central School District’s music program notched another feather in its cap during the recent Junior High Area All-State Music Festival. The eight Phoenix student musicians who performed during the Junior High All-State Music Festival are, in front, from left Skylar Patnode, trombone; Aidan Trumble, trumpet; Virginia Bednarski, trumpet; and Lily Roberts, French horn. Back, from left: Sarah Thorn, bass clarinet; Hailey Goudy, clarinet; Chloe Calkins, euphonium; and Thomas Uhl, trumpet. Eight Phoenix musicians joined select students from 44 school districts across the state to participate in the event, held Nov. 4-5 in Cortland. The Phoenix students, in grades seven through nine, performed a range of songs under the direction of James Spinazzola. According to PCSD music teacher Dave Frateschi, Phoenix was the third largest school district represented at the festival, which is a testament to its strong music program. For upcoming concert dates, please visit the district-wide calendar at www.phoenixcsd.org.